Undersecretary of Defense for Policy Michele Flournoy's principal deputy Dr. James N. Miller will be nominated to succeed her when she departs from the #3 job at the Pentagon in February, multiple defense sources tell Yahoo News. Flournoy, who has held the top civilian policy job at the Defense Department and been a key Obama administration national security player representing the department in the inter-agency NSC deputies committee meetings, is slated to step down from the job on February 3rd. Miller, her top aide, was sworn in as her principal deputy in April 2009 after Senate confirmation. In that role, he has served as Flournoy's "principal staff assistant ... and provides advice and assistance to the Secretary of Defense and Deputy Secretary on all matters concerning the formulation of national security and defense policy," his Pentagon biography says. As such, his impending nomination signals a great deal of continuity. 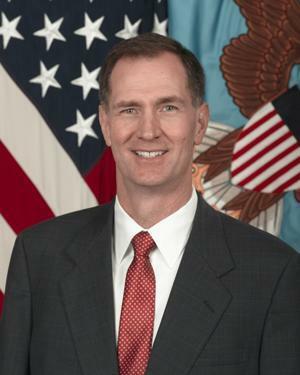 Miller previously served as senior vice president and director of studies at the Center for a New American Security (CNAS) think tank; as senior vice president at Hicks and Associates; as Deputy Assistant Secretary of Defense for Requirements, Plans, and Counterproliferation Policy (1997-2000), and as a staff member on the House Armed Services Committee (1988-1992). Miller was awarded the Department of Defense Medal for Outstanding Public Service in 2000. He did not respond to a query from Yahoo News on the nomination, which has not yet been announced. A Pentagon spokesman said he could not offer comment. The White House typically announces nominations of officials requiring Senate confirmation. Yahoo News previously reported that the NSC's Matthew Spence, a close aide to National Security Advisor Tom Donilon, has been tapped to become the next Deputy Assistant Secretary of Defense for the Middle East.